I think I’ve said this many times before, but it bears another mention: the year 2013 has been great for RPG fans. This year alone has granted us Fire Emblem: Awakening, Soul Hackers, Time and Eternity, Pandora’s Tower, Ni no Kuni, and the list goes on. And the year is only half over! 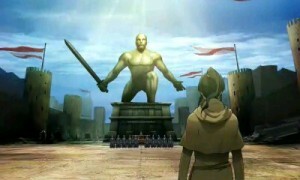 Which brings us to Shin Megami Tensei IV. 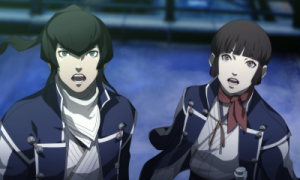 The game is significant in that it’s the next installment in the main Shin Megami Tensei franchise, a series which hasn’t seen its last entry since 2004’s Nocturne. For a series whose spinoffs have eclipsed the main titles in frequency and popularity (at least in the West) to receive a new entry means that whatever they have cooking is going to be big, or at least is the culmination of all of the things learned from every franchise title that has come out since then. In other words, this should blow Persona 4 out of the water. I can tell you that, although it doesn’t surpass Persona 4 in my book, it does at least succeed in being an incredibly addictive RPG that, while frustrating at times, provides plenty of incentive to remain in your 3DS. 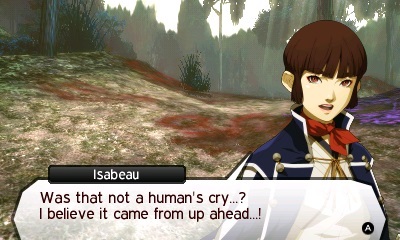 While Shin Megami Tensei IV doesn’t share any plot elements from prior games, it is at least thematically linked. As such, you will be dealing with the struggle between law and chaos and the repercussions of each. This also means that you don’t need to have played any other title in the series to understand what is going on, though certainly if you have, the various references and demons that you encounter will mean that much more to you. You play as a young man named Flynn (whose name can be changed to whatever you want), who makes a pilgrimage to the Eastern Kingdom of Mikado in order to undertake a trial to see if he’s suitable to become a Samurai. The way this is done is by slipping a computerized gauntlet over your arm, and if it comes to life, then you’re immediately brought into their ranks. This is a very rare occurrence, though naturally Flynn and a handful of others make the grade. With their new found stature comes the ability to summon demons to their aid, which they must use in order to combat the demons that find their way out of Naraku. Things are business as usual until a mysterious Black Samurai surfaces and begins spreading literature to the citizens of Mikado that not only cause unrest, but transform the readers into demons. Flynn and company’s pursuit of the Black Samurai leads them to uncover a number of truths that were kept from them and the kingdom’s citizens, which in turn unearths a number of fascinating discoveries for both the characters and the player, adding many wrinkles to an already interesting story. The team over at Atlus did a fantastic job not only building an interesting world around an otherwise standard medieval Japanese setting, but weaving a well thought out tale ripe with religious overtones. 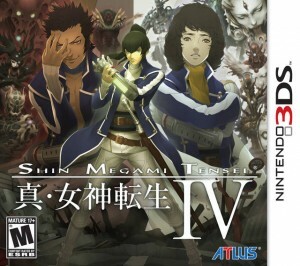 Shin Megami Tensei IV brings back the infamous Press Turn system from previous games, which lends advantages to those that can exploit elemental weaknesses of their opponents. When you engage in a battle, you’ll receive a turn for each member of your party. When you perform an action, one of those turns is expended as it would be with any other game. However, if you use a skill that targets the weakness of one of your enemies, you can reuse one of your turns. 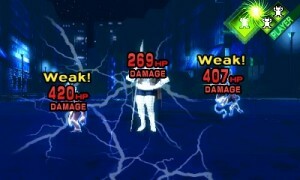 There are other things that can do this too, such as performing critical hits, but what it basically means is that you can double the number of actions in your turn. 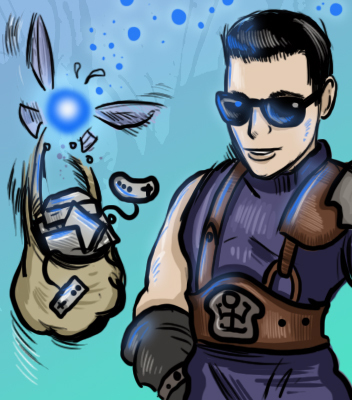 Your characters have a random chance to “smirk” when they nail a weakness too, bumping up their ability to dodge attacks and deliver a crippling blow during their next go-round. You can effectively shut down the enemy party before they even have a chance to damage you. On the flip side, this works for the enemy as well, which can make certain boss battles seem challenging. If your own weaknesses are not accounted for, you can get absolutely destroyed in battle, which is why saving frequently is so important. Also, using abilities that the enemy can block, reflect, or absorb will cause you to lose turns, turning the tables in the opposition’s favor even more. The nice thing is, once you receive your gauntlet, you can save anywhere you want, which is perfect for a portable title. If you somehow forget, an untimely death will merely send you to Charon’s doorstep, who will allow you to bribe him with Macca to return you back to life (though if you lack the funds, you can use the 3DS’s Play Coins instead). Much of your time will be spent navigating dungeons for one reason or another, which are inhabited by the enemies you do battle with. Since you can see their location before engaging them, you have an opportunity to strike them with your sword to inflict some initial damage as the battle starts. Likewise, if they sneak up on you, they can get the first move. 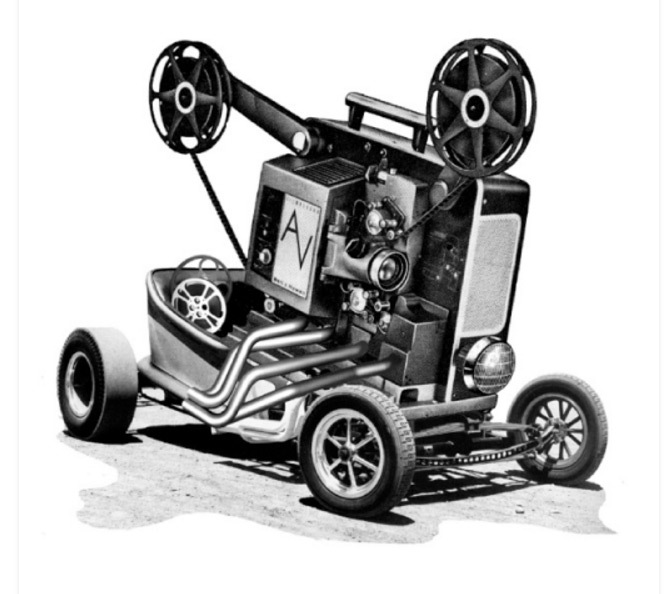 Navigation is aided by the A.I. in your gauntlet, named Burroughs, that will supply the bottom screen with a map, showing you areas that have been explored. She also keeps track of your quests (which come in main and challenge quest varieties) and manages your demons. Speaking of demons, they will be an important part of your offense. In addition to your main character, you are granted slots for three demons that can participate in battles. Acquiring demons is a matter of speaking to them in battle, though it’s a bit of a crap shoot. They will say things to you which you must respond to by selecting an answer that would most appease the type of personality that they have. If you say something to make them upset or scared, they will attack you or run away. If you do manage to reply with something they like, then they may ask for some form of compensation for joining, be it Macca or items. If you give them what they ask for, sometimes they will cut and run anyway, leaving you empty handed after all of the negotiations. As you might imagine, the lack of consistency may be a bit frustrating at times, especially if there’s a specific demon you’re trying hard to recruit. On the other hand, conversations are often humorous, and some demons will fall in your lap just by defeating its comrades (subsequently leading to it begging for its life and requesting to offer you compensation). Just obtaining demons won’t be enough to succeed. While each demon comes equipped with an innate set of skills, along with more that unlock as they level up, they’ll eventually reach a point where they plateau and don’t level as fast as Flynn does, or gain any additional skills. To remedy this, demons can be fused together to craft new demons that inherit abilities passed on from the demons that were fused. These demons can then “whisper” their techniques to Flynn, allowing you to customize him beyond just what stat gains can be awarded to him. If you regret fusing a demon for any reason, or would like another one in order to use to craft something else, they are stored in a compendium and can be withdrawn at any time for a nominal fee. Something you may end up doing anyway in order to craft “special” demons that require up to four demons at one time to construct. The system is way more user friendly than the Persona games, which led to me spending way more time on it than I otherwise would have. Burroughs can be installed with additional apps using points gained from level-ups that can do anything from increase the number of skill slots that Flynn or his demons have to gaining the ability to request money from demons when talking to them. She can also attach a demon to a card to be used during StreetPass which will allow that demon to offer assistance to people your system communicates with who also own the game. They can even return to you bearing gifts (something I unfortunately didn’t get to test as of this writing). The interface as a whole is just incredibly well done. Now for the bad news. As useful as it is to have a map on the bottom screen, it’s not nearly as helpful when not in a dungeon. Navigating the overworld, as it were, has your party represented by a marker that you move across the map. Many of your paths are blocked off, and enemies will randomly spawn (represented by static blobs) and race towards you to initiate combat. However, so far as I could tell, the only way you could discern what a particular location’s name was is by hovering over it. A number of quests will direct you to some landmark by describing where it is in relation to a particular part of the city. As someone who is absolutely terrible at remembering names, how is this at all useful to me if I can’t see the names displayed on the map? Telling me something is west of something else is useless if I can’t recall where that place was or identify it on the map. 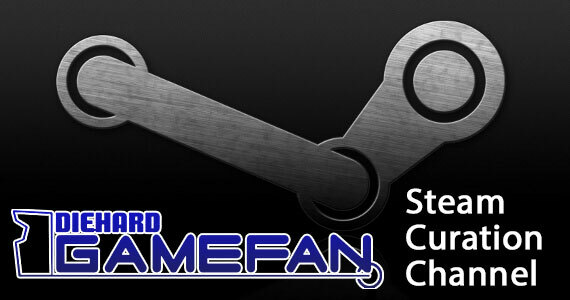 This would be especially problematic for someone who sets the game down for a long period of time. At least the various terminals that allow you to warp around to different places have names attached to them. Keep in mind that I say this as someone who is more bothered by being lost than being crushed by a boss fight over and over (though I will admit to getting a taste of both in this game). Another issue I had is that, despite the distinction between main quests and challenge quests, there are still a number of instances where completing challenge quests is a requirement. My interpretation of challenge quests is that it’s another name for side quests, meaning optional content. If I’m required to do some of them anyway, why make the distinction at all? I remember one instance, towards the endgame, that my choices led me along a route that required I do every challenge quest that I had available to me in order to progress. While some of these have interesting backstories, a majority of them are “deliver X amount of Y” or “go kill Z.” If it’s not exciting enough to be included in the narrative, it should probably not be a requirement for advancement. There also seems to be a number of arbitrary roadblocks to progression, including a quest that required me to actually type in the name of a god (which Burroughs kindly gave me some helpful hints on), but again, I am terrible with names, so there didn’t seem to be any worthwhile reason to make me fumble through my brain (and Google) figuring it out. The presentation might come as a bit of a shock to fans of Nocturne, as it looks more like Strange Journey in regards to the battles. You still control a three dimensional Flynn as you explore dungeons, though battles are fought from a first person perspective. This means that all of the demons are 2D animated sprites (though good looking ones at that) and all cutscenes are done using still portraits. There are a few “anime” movies strewn throughout, though I use that term loosely since the amount of animation in them is rather limited. Flynn’s appearance can be somewhat customized based on the weapons and armor you purchase for him, which was neat. On the plus side, the game utilizes the 3D capabilities of the 3DS rather well. When the characters are talking, some are placed in front of others, so even though they are 2D stills, it will appear as if one is standing in front of another. Navigating corridors likewise creates a sense of depth as you’re moving along. The effect is less impressive on the map screens and during the movies, but is still present. The entirety of the game is voice acted in English, and the cast did a superb job of bringing the characters to life. I was quite impressed with the amount of spoken dialogue in the game, as even some of the challenge quests have a number of lines that you wouldn’t expect. The music is wonderfully composed too, which makes it all the more exciting that some of the soundtrack comes packed with the game. In case you were wondering why Shin Megami Tensei IV costs $50, all it takes is one look at the box to make you go “oh.” The packaging is massive, eclipsing the height of the Kingdom Hearts 3D collector’s edition. Aside from the game, it includes a CD soundtrack and a massive book that serves as both an art book and a mini-strategy guide for the game. It only covers the first part of the game, but I can’t describe to you how helpful it is. It gives you direction both in terms of main quests and challenge quests, plus it provides charts for demon fusions and items that can be purchased. I’m glad this was included. Despite some of the more questionable design decisions, I would be lying if I said I didn’t play this game non-stop from the moment it arrived at my door until the credits finally rolled. It took me approximately fifty hours to get through it, doing the bare minimum on one route. There are multiple paths to the end as well as various endings, plus over a hundred challenge quests that will be included in the game (with more being added later as DLC) and a new game plus mode that unlocks upon completion. It’s a challenging game to be sure, though multiple deaths will unlock an easier difficulty for those struggling with it. It may not be as appealing to the mainstream as, say, a Persona game would be, but it’s definitely one of the easier SMT games to get into, and despite the high price, comes loaded with much content to keep you busy. Shin Megami Tensei IV finally releases on the Nintendo 3DS after almost a decade since the last main entry arrived on the PlayStation 2. The plot is both dark and thematically interesting, equipped with multiple routes and endings to unlock. It’s also quite challenging, though an easier difficulty setting, an included strategy guide, and helpful tutorials help bridge newcomers rather nicely. The Press Turn system is as enjoyable as ever with the new “smirk” ability, and you will find yourself engulfed in demon fusion before you even realize what’s happening. A few things hold the experience back slightly, such as an unhelpful overworld map and demon recruitment that feels like it’s based too much around luck. 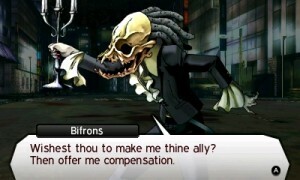 Still, the quality of the core experience manages to eclipse any shortcomings, making Shin Megami Tensei IV a worthwhile addition to any RPG library. I played this for like eight hours yesterday. It’s pretty fun. I was a little disappointed the CD only has like eight songs on it and the guide doesn’t go over evolution for more than like two sentences, but the LE is pretty nifty too, otherwise. Yeah, I wish the CD had more songs on it as well, though having a small sampling seems to be more commonplace with pack-ins. Persona 1 on PSP had a 2 disc soundtrack, but Atlus doesn’t seem to really do that anymore, which is unfortunate.